P.S. City ID #3422 Primary renter must be at least 25 years of age. No Pets Allowed. 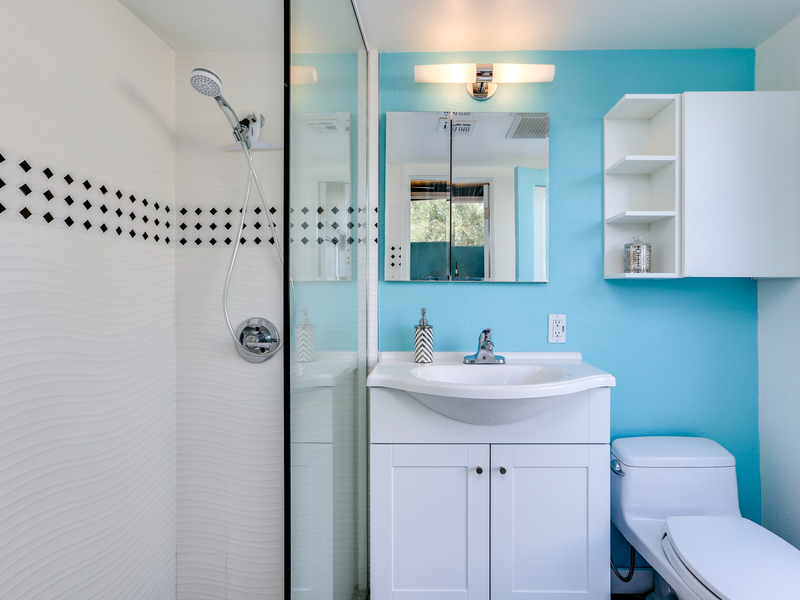 Remodeled mid-century home. Mountain views. Private yard w pool/spa, fire pit lounge, outdoor kitchen, covered dining pavilion, outdoor shower, ping pong. Off street parking. Beds: K, Q, K (can be converted to TT upon request). 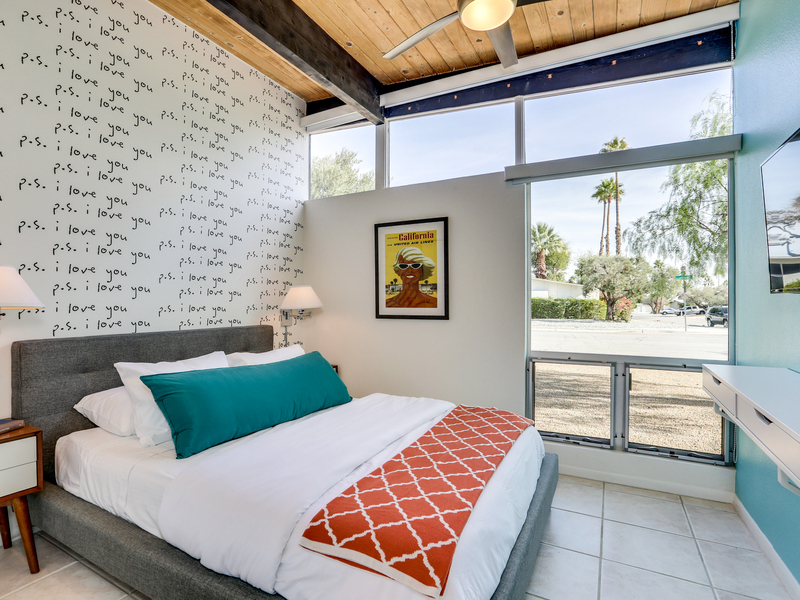 This house is so gorgeous it has been included on the 2017 Palm Springs Modernism Week Home Tour! Better than new Palm Springs Vacation Home Rental. Entire property has been updated. Fabulous resort-style saltwater pool yard that has been walled for privacy. Gorgeous mountain views from the heated inground pool, spa, covered dining pavilion, and outdoor living room. Awesome fire feature plus an outdoor shower. Now taking reservations for bookings at this stunning remodel of an iconic mid mod vacation home where it's all about relaxing in the Palm Springs sunshine. This classic Alexander Butterfly home (circa 1961) has been lovingly restored - respecting its architectural pedigree while updating it for the way we live today. 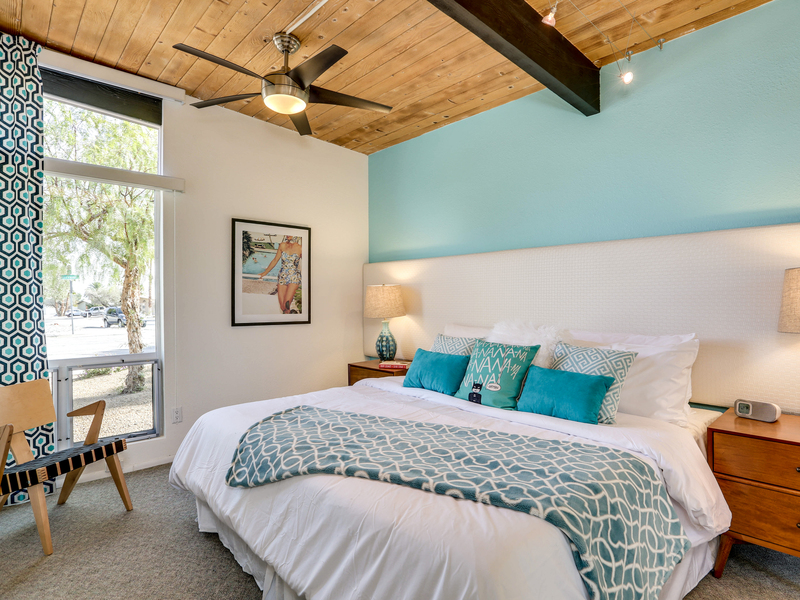 The original post and beam ceilings have been preserved while adding modern conveniences like high speed internet access, updated heating and cooling, and four flat screen televisions. Gorgeous in its simplicity, as Mr. Alexander and his architects Palmer and Krisel intended, you'll find clean lines, an open concept floor plan and spectacular walls of glass that let the light pour in and reveal a stunning country club backyard. The living room, dining area and kitchen are all open to each other - providing enough space for your entire group to gather, relax and enjoy. The living room has been tricked out with an over sized mid mod-inspired sectional sofa, a full size vintage Elvis movie poster, and a 55"/ 4K TV with premium Martin Logan speakers. The stereo system has Pandora and internet radio. 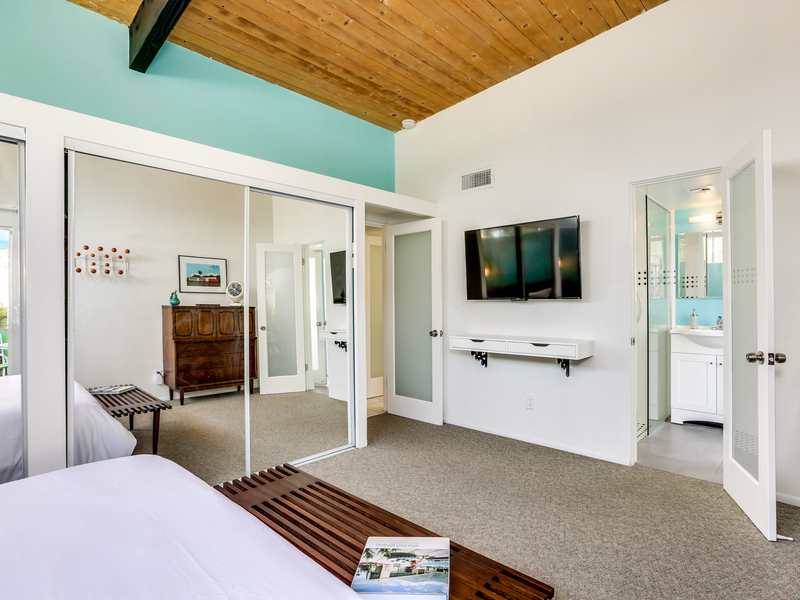 All of the bedrooms feature comfortable hotel-quality mattresses, ample storage, and flat screen televisions.The master bedroom offers a king-sized bed, an en suite bath, and its own courtyard patio with direct pool access. The two guest rooms share easy access to the hall bath. The King Bed in the third guest room can be converted to two Twin beds upon request. This property captures the magic of Southern California glamour. The mountain views are simply spectacular. The backyard itself is heavenly. So private, spacious and well-planned. The inground pool and spa is surrounded by chaise lounges, shade umbrellas, a napping hammock, an outdoor shower and a rolling green lawn area that's great for kids and pets. The outdoor kitchen, with its built-in gas barbecue, ice chest and long serving counter - is adjacent to the covered dining pavilion. You'll also find a very comfortable outdoor living room with an awesome two-level fire feature. There is a bar height fire table and a cocktail height fire table - perfect for your entire group to gather poolside and enjoy the spectacular mountain views. Slip thru the sliding glass doors into the converted game room where you'll find a ping pong table and an extra hangout area. "We were consistantly blown away by this house. It has everything we needed and more. The house was the perfect amount of room for 6 adults and two babies. The kitchen comes fully loaded, the pool has tons of loungers and floaters, and the garage has tons of games. 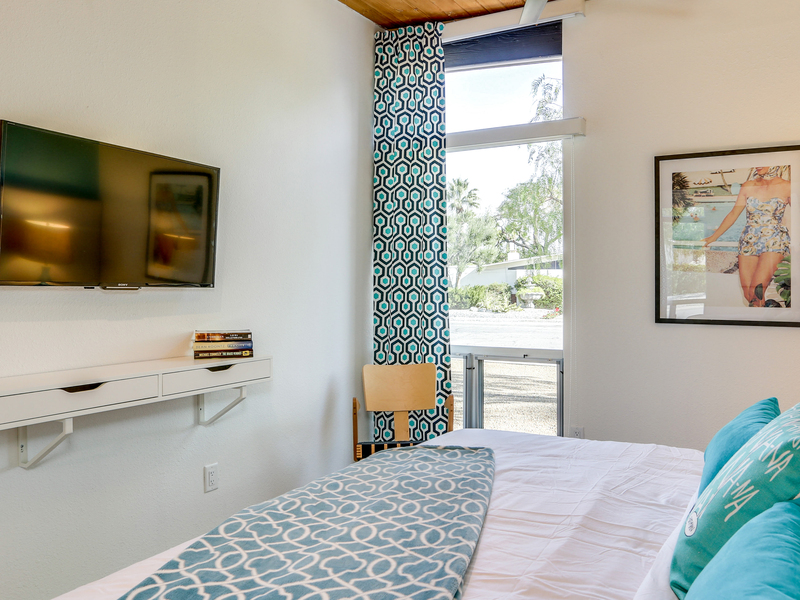 Big flat screens in every room with Nest AC control. Oh and the kitchen has chef grade pots, pans, knives. We shall return!" "This past weekend my girlfriends and I stayed at the Mellow Yellow Butterfly ACME home!! It was nothing short of amazing. The property has amazing views, an incredible out door area and is fairly close to everything. Not walking distance but a short 5 min drive. To say we had a blast would be an understatement. We absolutely love this ACME house. It was decorated perfectly for a Palms Springs weekend vibe and we all agreed if we were ever back we wouldn't even search for a better place. This is the one!!! There were 5 of us but the house could easily fit 6. If you are looking to spend a weekend in this town then hands down this is the house to stay at. " 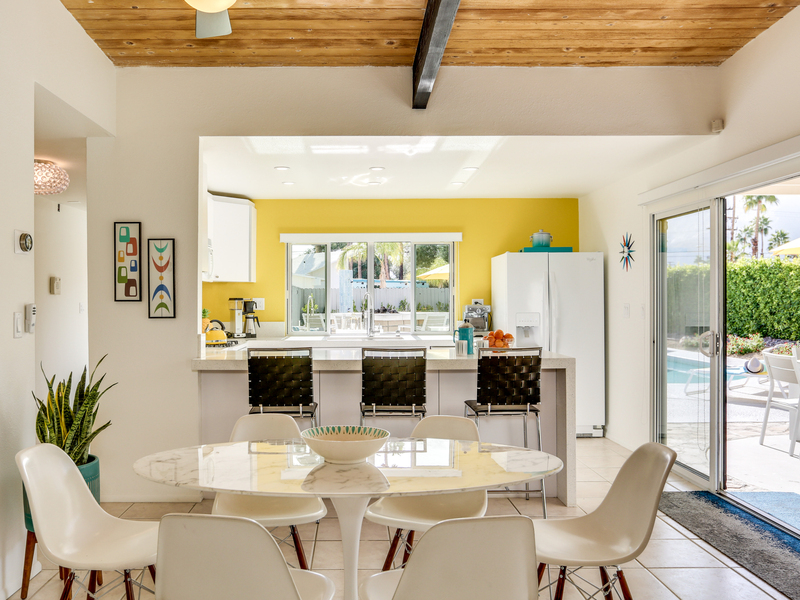 "I could not have asked for a better first visit to Palm Springs with this beautiful, retro-chic home. Myself and 5 other friends escaped LA for the weekend to enjoy a little fun in the sun. This house had EVERYTHING we could've asked for and more! From the pool to the outdoor grill and 3 bedrooms, we were very comfortable and never needed to leave the house. It was by far the best home away from home I have ever stayed at. I will definitely be back!" "This house is 100. It's conveniently located for trips into town; it's situated on the lot ideally to soak up sun and mountain views with zero road noise; it's appointed to perfection with everything discerning guests could want in a desert getaway. The thoughtfulness put into this house sets it several notches above other houses I've rented in the area over the course of 8 years. 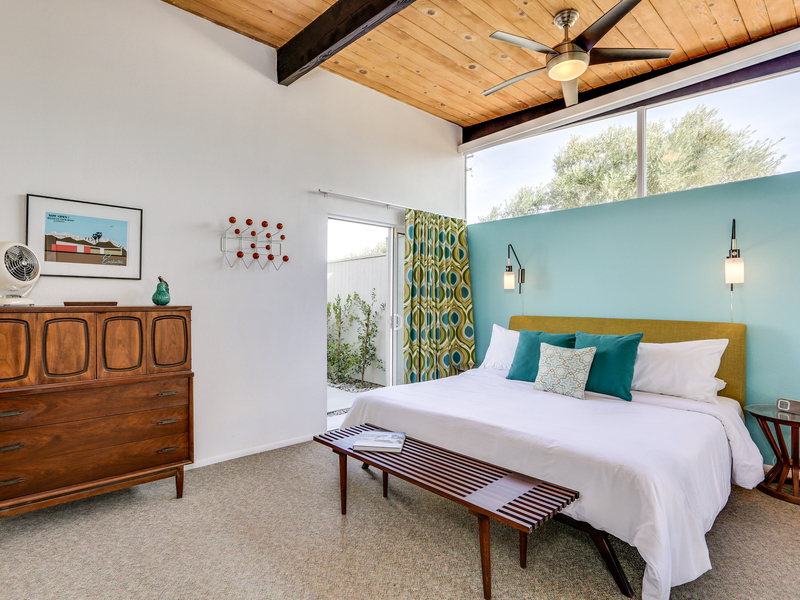 Mid-century modern lovers will geek out over the beautiful butterfly roofline and authentic interior design and gorgeous furniture. Picky vacationers will love the selection of cooking, dining, and entertainment options--from coffee makers, to cutlery, to citrus presses. And for those of us who just want a picture-perfect spot to melt away our stress, the under-palm hammock, tranquil pool, and outdoor fire pits are oh-so-soothing. I can't rave enough about this property: it's lush without being obscene, environmentally-appropriate without being austere. The indoor/outdoor kitchen-bbq arrangements are an entertainer's dream. If you're looking for a sophisticated spot, you must try mellow yellow butterfly. " Comfort and style with amazing views! "We were lucky enough to stay at Mellow Yellow Butterfly for my bachelorette party, and this was one of the best vacations I have ever been on. This vacation home had it all - stylish, modern decor, fully stocked kitchen, comfortable beds, and a hot tub/pool in the back with breathtaking views of the mountains. The house is just a short drive away from shopping, restaurants, hiking, and the airport - you really can't ask for more! We felt at home right away and didn't want our relaxing vacation to end. I will definitely be back to enjoy another stay at Mellow Yellow Butterfly!" "We just can't say enough good things about this vacation home rental. 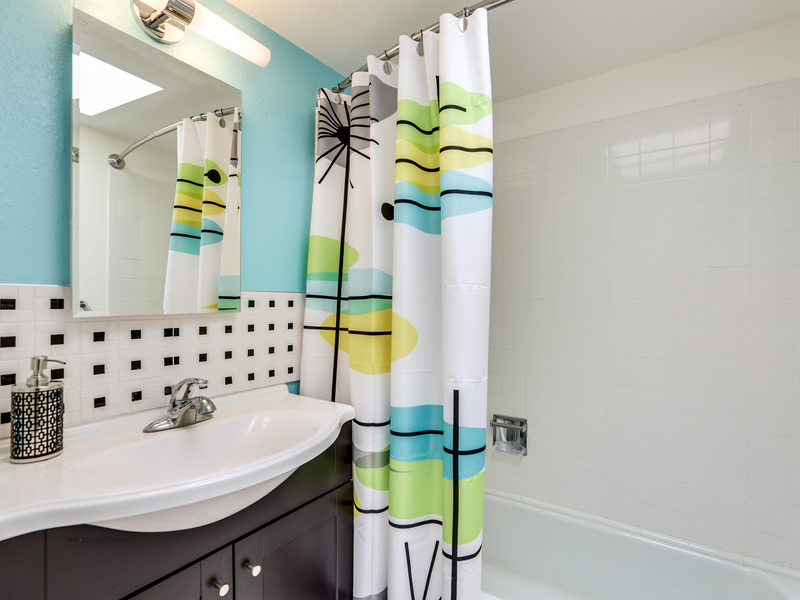 Mellow Yellow Butterfly is clean, comfortable and feels like a model home but like a real home at the same time. Kitchen was well stocked. The beds were really nice. Everyone had great sleeping nights. The back yard was over the top amazing. Super mountain views. A fire pit like we have never seen before. And a really cool outdoor shower. This place had it all. " "Our family had a wonderful vacation at the MYB! 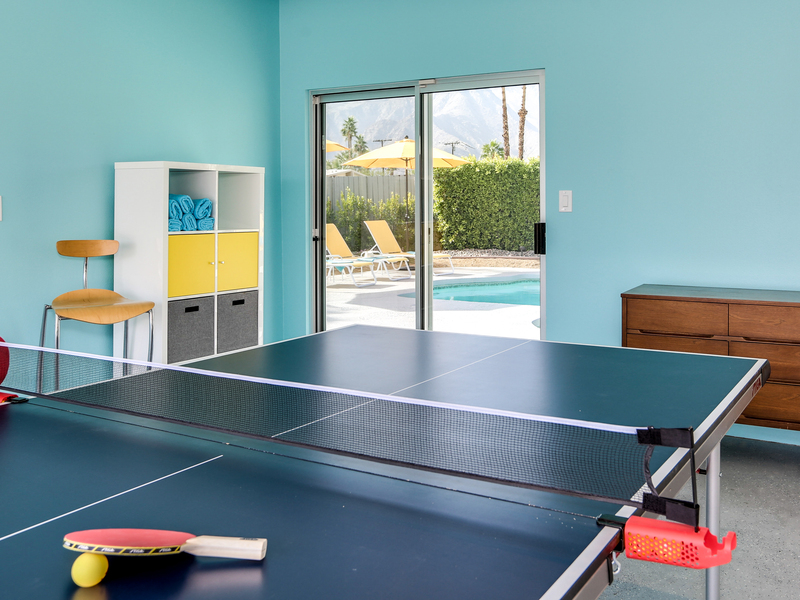 The teen boys could not get enough of the ping pong room, the pool and oddly enough endless sports on the big screen TV. We originally planned to dine about town and explore the area but found we could not bear to leave our beautiful nest. A quick handy grocery shop and a couple fun meal deliveries and we were set. We cant wait to return." "Loved this property! Great layout and very comfortable atmosphere! The best part was everything! The biggest surprise was how nice the accommodations were, and all the extra amenities. Would love to have this as my own vacation home!" "We could not have been more pleased with our stay at the mellow yellow butterfly. My husband and I were looking for a relaxing getaway to bring our 5 week old newborn daughter and this home was just what the doctor ordered! 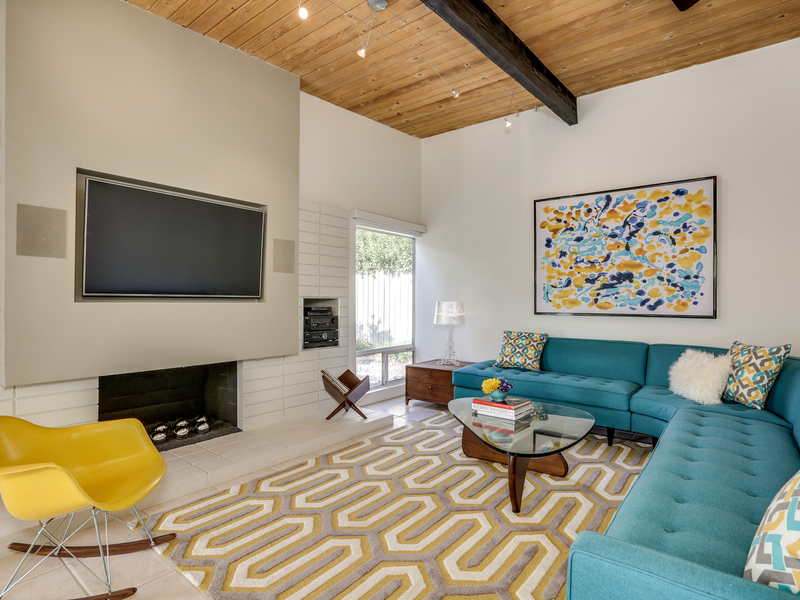 The house is mid century modern but you can tell it's been completely updated and the decor is very tastefully done. The kitchen is fully stocked with every item you could ever possibly need, including 3 types of coffee machines! I loved that all the bedrooms are all brightly lit with natural light but also have shades to keep the room darker if you prefer. The beds were so comfortable that we slept in for once in our lives and even our new baby got her first 6 hours of straight sleep :) . The backyard and pool have every amenity you need, including fun pool floats, a ping pong table, outdoor shower, fire-pit, a nice big BBQ with outdoor kitchen and a hammock. We spent most of our time hanging by the pool and grilling on the BBQ and even set up a beautiful al Fres'co dinner on the outdoor dining table. Last but certainly not least is the beautiful view of palm trees and mountains that look like something out of a postcard! Needless to say, we would recommend this house to all of our friends!" 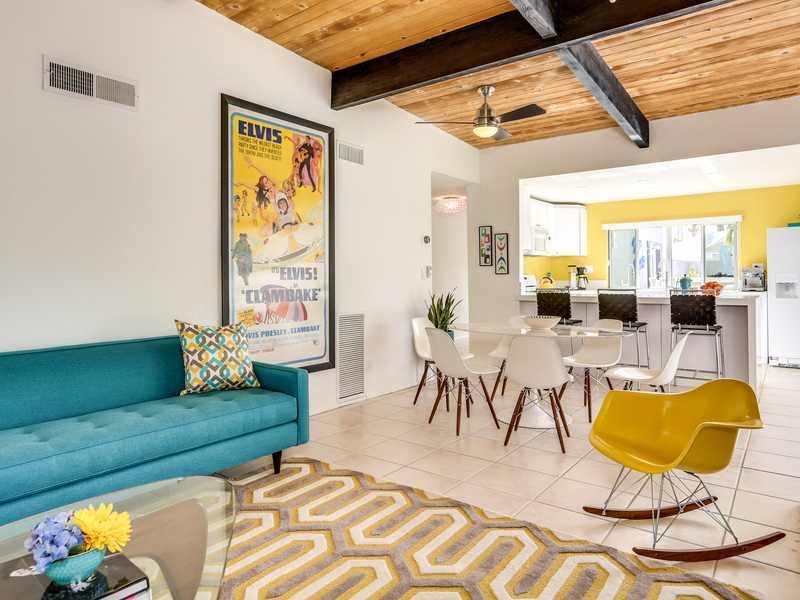 "This is a beautifully decorated in Palm Springs mid century modern from head to toe. It is a delight to look at and just so much fun. The attention to detail in the amenities is unparalleled by any vacation home I've stayed in. Anything you could want or need during your stay, had already been thought of and provided: skewers for BBQing, plastic ice cubes to keep your drinks cool, but not water them down, on trend floats for pool instagram magic. This house has something for everyone: a hammock and shaded patio for those looking to relax, a pool, jacuzzi and fire pit for plenty of group hangout spots, a great indoor AND outdoor kitchen. We had a lovely girls weekend here and could not have enjoyed our stay more- we barely left the house!" "Everything was great! The best part was the ease when booking, and no hidden or additional costs afterwards. A small bar fridge in the garage would be a great addition! " "Friends of ours invited us out for a few days while they rented this vacation home. We were blown away by the attention to detail, the fabulous space planning and the absolutely stunning mid mid design. Mellow Yellow Butterfly is made for fun! We smiled and laughed (and drank wine) the entire time. The most amazing part is that where ever we wanted to hang out on the property (and there were lots of choices) there was always enough room for everyone in the group. Can't say enough about how wonderful this property is and how gorgeous it looks." "Me, my wife and my son were visiting from France and had a wonderful experience at “Mellow Yellow Butterfly.” It is conveniently located in Palm Springs, close to the airport and downtown. The house was perfect for the 4 of us, and our son had a blast in the nice swimming pool, while we were having cocktails and relaxing on the multiple outside tables and hammock. The garage and the ping pong table were also a plus, to keep our 5 year old busy. We’d definitely stay at this house again, when we go back to Palm Springs!" "We stayed with my 2 cousins and their son for three days at this beautiful and charming house. It is located in a quiet and clean neighborhood of Palm Springs, minutes from downtown. Palm trees and the view of the mountain from the backyard are simply gorgeous and breathtaking. The house is furnished with taste, quality and nice furniture. It is obvious that the place has been recently remodeled. The bedrooms are spacious and bright. I could NOT say enough about the awesome beds, where I actually slept better than at home... We loved the attention to details, such as the cool posters (very Palm Springs) and the floats for the swimming pool! I do recommend!" A "mellow" stay at an excellent property! "Excellent comfort, style, and cleanliness. We had an excellent stay! A great recommendation from friends!" 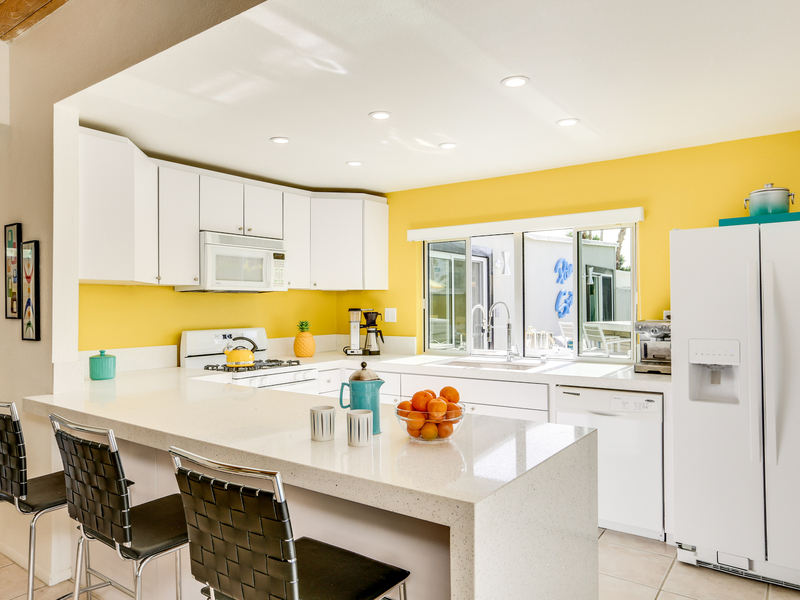 "I loved the Mellow Yellow Butterfly house, I stayed with my wife and 8 year old on an escape from LA weekend and what a relaxing and comfortable house. The attention to detail is fantastic. Staying in a mid-century modern house that was tastefully modified to add modern amenities with a great heated pool and hot tub really relaxed the whole fam so we could chill and just do a few Palm Springs hikes and outings. The outdoor kitchen is so practical and the fireplace was nice to hang out at after a night swim, San Jacinto mountain is super stunning from the deck chairs and the outdoor shower is just fun! We will come back to Mellow Yellow Butterfly very soon!"